This page is a archive of the WWDC topic. Verizon is the previous topic. During the 2009 Worldwide Developers Conference keynote on Monday, Apple unveiled a near feature complete version of the company's next operating system for Apple Macintosh computers, Mac OS X 10.6 Snow Leopard. Apple announced that it will be available in September as a $29 upgrade for users of Mac OS X 10.5 Leopard. In just under an hour Apple will be kicking off the 2009 Apple Worldwide Developers Conference (WWDC) at 10:00 a.m. PST. A team of Apple executives, led by Apple's senior vice president of Worldwide Product Marketing, Philip Schiller will deliver the keynote. Apple will highlight two new operating systems Mac OS X Snow Leopard and iPhone OS 3.0. Apple today has provided details about 80 Sessions and Labs for the 2009 Worldwide Developers Conference in San Francisco, California. The conference will take place from June 8 - 12 at Moscone West. Apple's Worldwide Developers Conference (WWDC) will take place from June 8th through 12th in the Moscone West convention center in San Francisco, California. Apple will be conducting three tracks at the 5-day event: iPhone, Mac, and IT. Speculation is running rampant amongst Apple watchers that the firm's annual Worldwide Developer's Conference (WWDC) will be held during June 6-12. It was first speculated by the Baltimore Sun and has been picked up by numerous outlets. It's widely anticipated that Apple will demonstrate and/or announce Snow Leopard, Mac OS X version 10.6 at WWDC. Apple announced today that a team of Apple executives, led by CEO Steve Jobs, will participate in the company's annual Worldwide Developers Conference (known as WWDC) keynote address slated at 10:30 am PST on Monday, June 9, 2008 at San Francisco's Moscone West. The event will run through June 13. On Thursday March 13, 2008 Apple Inc. announced that its annual developers conference (WWDC) will take place from June 9 - 13 at the Moscone West convention center in downtown San Francisco. The company also stated that this year's event dubbed WWDC 2008 will be a "landmark" event. At WWDC 2007 Apple CEO Steve Jobs unveiled Safari 3 Public Beta, the next version of the Safari web browser. According to Apple Safari 3 is world’s fastest and easiest-to-use web browser for Macs and now Windows PCs. WWDC 2007 begins today - Steve Jobs to deliver keynote presentation - Switcher Features in Leopard? It's finally here, Apple's annual Worldwide Developers Conference. Apple CEO Steve Jobs will kick off the event with a 10:00 a.m. keynote presentation at San Francisco’s Moscone West conference center. In a May 1, 2007 press release titled "Steve Jobs to Kick Off Apple's Worldwide Developers Conference 2007", Apple confirmed that its CEO Steve Jobs will initiate the annual Worldwide Developers Conference (WWDC) with a keynote address starting at 10:00 a.m. on Monday, June 11, 2007 at San Francisco's Moscone West conference center. Mac OS X Leopard 10.5 - a May 2007 release? 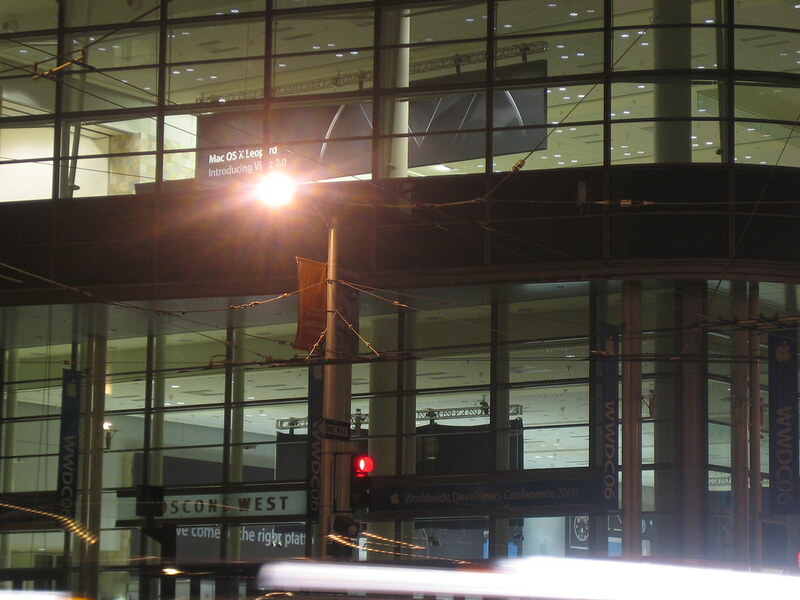 At the 2006 Apple Worldwide Developers Conference at San Francisco's Moscone West, Apple Computer's CEO Steve Jobs kicked off the event with his usual keynote. Jobs touched on numerous topics such as tid bits on the conference, Apple Retail Store data, and new Hardware announcements. Most of the attention, however, was on the OS X 10.5 Leopard preview that Apple demonstrated to the public for the first time. Jobs stated that the public release of Leoaprd is targeted for Spring 2007. Developers attednding the conference will be provided with a developer preview copy of Leopard that includes all technologies and features shown during the demo. Of note, there was no "One More Thing" announcement from Jobs. "Mac OS X Leopard, Introducing Vista 2.0"
"Mac OS X Leopard, Hasta la Vista, Vista"
"Join the thousands of Mac developers who will be attending WWDC 2006, and be one of the first to preview Mac OS X Leopard. You’ll get the chance to explore the latest Mac tools and technologies, and to learn the advances that are keeping Mac OS X far, far ahead of the competition."